National Board of Review Awards: Hereafter, starring Matt Damon and Bryce Dallas Howard. Directed by NBR favorite Clint Eastwood, the poorly received metaphysical drama is listed as one of the year's Top Ten movies. Besides Matt Damon and Bryce Dallas Howard, the Hereafter cast includes Cécile de France, Jay Mohr, Frankie McLaren, George McLaren, and veteran Marthe Keller (And Now My Love, Marathon Man). Dec. 3 update: What's more interesting about the 2010 National Board of Review (NBR) awards? The list of those who won or of those who were snubbed? Oliver Schmitz's South African drama Life, Above All among the Top Five foreign-language “runner-up” movies. Best Original Screenplay winner Buried, the story of an American contractor (Ryan Reynolds) buried alive in Iraq. Chris Sparling wrote the script; Rodrigo Cortés was the director. Lesley Manville as Best Actress for Mike Leigh's Another Year. See our National Board of Review Award predictions further below. In the case of Hereafter, its inclusion may be explained by the fact that Clint Eastwood has an ardent National Board of Review following. In fact, since Mystic River in 2003, every single one of his films have been included on the NBR's Top Ten list. Additionally, Eastwood himself won Best Director honors last year for the not all that warmly embraced Invictus and was chosen Best Actor for Gran Torino the year before. In 2004, he won the NBR's Special Achievement Award for producing, directing, acting in, and composing the score for Million Dollar Baby. Lisa Cholodenko's The Kids Are All Right. Niels Arden Oplev's The Girl with the Dragon Tattoo. Peter Weir's The Way Back. John Cameron Mitchell's Rabbit Hole. Nigel Cole's Made in Dagenham. Additionally, Christopher Nolan's summer blockbuster Inception, Tom Hooper's spleeper-hit-in-the-making The King's Speech, and Joel and Ethan Coen's Western True Grit failed to win a single NBR award, though all three were included among the year's Top Ten runner-up films. And finally, Nicole Holofcener's indie Please Give and Roman Polanski's 2010 European Film Award winner The Ghost Writer were included only among the year's Top Ten (English-language) independent films. In all, David Fincher's The Social Network was the big National Board of Review winner, collecting four awards: Best Film, Best Director, Best Actor for Jesse Eisenberg for his characterization of controversial Facebook co-founder Mark Zuckerberg, and Best Adapted Screenplay for Aaron Sorkin. The somewhat surprising Best Debut Directors were Sebastian Junger and Tim Hetherington for the Afghanistan War documentary Restrepo. Debra Granik, whose Winter's Bone was the year's sleeper low-budget indie hit, would likely have been the winner if it weren't for the fact that her debut feature was the 2004 drama Down to the Bone. Another curious choice was the selection of Sofia Coppola's controversial Venice Film Festival winner Somewhere for the year's Special Filmmaking Achievement Award. Coppola was honored for writing, directing, and producing the existentialist drama about a troubled movie star (Stephen Dorff) and his tentative relationship with his young daughter (Elle Fanning). Just as curious was the fact that Somewhere was nowhere to be found among the National Board of Review's Top Ten runner-up films or their Top Ten independent films. Lesley Manville in Another Year: The National Board of Review's surprising Best Actress winner is now a likely contender for the 2011 Academy Awards. Every single NBR Best Actress of the last decade, from Julia Roberts to Carey Mulligan, has gone on to receive a matching Oscar nod. Three of them (Roberts, Halle Berry, Helen Mirren) ended up taking home an Oscar statuette. This year, the National Board of Review mostly opted for less well-known names in the acting categories. Whereas Best Actor/Best Actress award recipients in the last decade have usually been people like Sean Penn, Annette Bening, Javier Bardem, Julia Roberts, George Clooney (twice), and Helen Mirren, NBR 2010 winners turned out to be Jesse Eisenberg and Lesley Manville, neither of whom is what you'd even remotely call a household name in the United States. Eisenberg's Mark Zuckerberg was singled out instead of higher-profile star turns such as Colin Firth as King George VI in The King's Speech, Jeff Bridges as eye-patch-wearing cowboy Rooster Cogburn in True Grit, and James Franco as hiker/adventurer Aron Ralston in 127 Hours. As a desperately lonely, middle-aged single woman in Mike Leigh's British comedy-drama Another Year, Lesley Manville beat the likes of Annette Bening and Julianne Moore for The Kids Are All Right, Nicole Kidman for Rabbit Hole, and Natalie Portman for Black Swan. Both Jesse Eisenberg and, especially, Lesley Manville have been mentioned as potential Oscar contenders. In addition to looking good in their For Your Consideration ads, the odds are that their National Board of Review victories will be matched by Academy Award nominations. In the last ten years, eight NBR Best Actors (out of eleven winners; George Clooney tied with Morgan Freeman last year) and all ten Best Actresses have gone on to be shortlisted for the Oscars. Of these, four actors and four actresses came out victorious. Things are a little iffier for Jennifer Lawrence following her National Board of Review Breakthrough Performer win for her portrayal of an Ozark Mountains teenager in search of her missing father in Winter's Bone. Ellen Page (Juno) and Ryan Gosling (Half Nelson), to name two, landed Oscar nominations after their NBR Breakthrough victories, but Emile Hirsch (Into the Wild) and Dev Patel (Slumdog Millionaire), on the other hand, failed to be shortlisted. National Board of Review Best Supporting Actress winner Jacki Weaver in Animal Kingdom. David Michôd's Australian crime family drama may end up earning the veteran Weaver a Best Supporting Actress Oscar nomination and an Australian Film Institute Best Actress win. Veteran Jacki Weaver's win for David Michôd's Australian crime/dysfunctional family drama Animal Kingdom was the latest offbeat choice in the NBR's Best Supporting Actress category. Former winners include Lupe Ontiveros (Chuck & Buck), Patricia Clarkson (Pieces of April & The Station Agent), Catherine O'Hara (For Your Consideration), and Gong Li (Memoirs of a Geisha). Five of the NBR's Best Supporting Actress winners earned Oscar nods in the last decade. Only one of these, Penélope Cruz for Vicky Cristina Barcelona in 2008, went on to take home the Oscar statuette. Weaver may or may not get an Oscar nomination – it all depends on how much more love she gets from U.S. critics groups and perhaps the Golden Globes, which should then make Academy members take a good, hard look at Animal Kingdom. And finally, Batman Begins and The Dark Knight star Christian Bale was the sole expected National Board of Review winner in the acting categories. To play the part of a drug-addicted former boxer in David O. Russell's sleeper hit The Fighter, Bale lost weight and thinned his hair – and will quite likely get an Oscar nomination in a field that remains wide open. Directed by Ben Affleck, who also stars, the crime drama The Town was the Best Ensemble winner. Besides Affleck, the cast includes Jeremy Renner, Rebecca Hall, Jon Hamm, Blake Lively, Slaine, Pete Postlethwaite, and Chris Cooper. Best Foreign Language Film: Of Gods and Men, dir. : Xavier Beauvois. Best Actress: Lesley Manville, Another Year. Best Supporting Actress: Jacki Weaver, Animal Kingdom. Best Ensemble Cast: The Town. Best Original Screenplay: Chris Sparling, Buried. Breakthrough Performance: Jennifer Lawrence, Winter's Bone. Debut Director: Sebastian Junger and Tim Hetherington, Restrepo. Production Design Award: Dante Ferretti, Shutter Island. Best Documentary: Waiting for 'Superman' dir. : Davis Guggenheim. Spotlight Award: Sylvain Chomet and Jacques Tati, The Illusionist. Special Filmmaking Achievement Award: Sofia Coppola, for writing, directing, and producing Somewhere. NBR Freedom of Expression Award: Fair Game, Conviction, Howl. William K. Everson Film History Award: Leonard Maltin. National Board of Review Best Film winner The Social Network, with Best Actor winner Jesse Eisenberg. David Fincher's Facebook movie is already the odds-on favorite this awards season and a typically serious-minded NBR Best Film pick. In the film, Jesse Eisenberg plays controversial Facebook founder Mark Zuckerberg. National Board of Review predictions: Serious-minded Best Film? Dec. 2: The 2010 National Board of Review winners will be announced in a few hours. Below are a few strong possibilities in the top categories, based on both what's hot this year and NBR winners of the last decade. When it comes to their choice of Best Film, NBR voters usually opt for mainstream (as in, not “experimental”) dramas with a strong social (or at least “serious”) message, e.g., Quills (2000), The Hours (2002), Finding Neverland (2004), Letters from Iwo Jima (2006), Up in the Air (2009). The most acclaimed 2010 English-language release to fit that pattern is David Fincher's The Social Network, followed by Tom Hooper's British-made The King's Speech. Other strong contenders: Danny Boyle's 127 Hours, Lisa Cholodenko's The Kids Are All Right, and Debra Granik's Winter's Bone. The Best Foreign Language Film will quite likely be Alejandro González Iñárritu's Biutiful, which also has a forceful psychological/social message. Other possibilities: the international box office hit The Girl with the Dragon Tattoo, White Material, and Mother. For Best Documentary, Davis Guggenheim's Waiting for 'Superman' is the likely, socially conscious winner. But The Tillman Story, Client 9: The Rise and Fall of Eliot Spitzer, Inside Job, Restrepo, and Exit Through the Gift Shop are all strong possibilities. Barring a major upset, the Best Animated Feature will be Lee Unkrich's Disney/Pixar blockbuster Toy Story 3. Best Director David Fincher or Tom Hooper? The Best Director will likely be either David Fincher for The Social Network or Tom Hooper for The King's Speech. Else, Darren Aronofsky for Black Swan or Danny Boyle for 127 Hours. In 2008, Fincher won the Best Director award for The Curious Case of Benjamin Button, whereas Boyle's Slumdog Millionaire won Best Picture. Their roles could well be reversed this year. National Board of Review screenplay picks should be the following: Best Adapted Screenplay going to Aaron Sorkin for The Social Network and Best Original Screenplay going to David Seidler for The King's Speech. Debra Granik and Anne Rosellini for Winter's Bone. David Lindsay-Abaire for Rabbit Hole. Lisa Cholodenko and Stuart Blumberg for The Kids Are All Right. Jez Butterworth and John-Henry Butterworth for Fair Game. David Michôd for Animal Kingdom. Nicole Holofcener for Please Give. In recent years, the National Board of Review voters have tended to stay within the mainstream in the Best Actor/Best Actress categories (e.g., Diane Keaton, Julia Roberts, Halle Berry, George Clooney), while venturing off the beaten path every now and then in the supporting categories (e.g., Lupe Ontiveros for Chuck & Buck in 2000; Patricia Clarkson for Pieces of April and The Station Agent in 2003). The 2010 Best Actor could well be former NBR winner Javier Bardem (Before Night Falls, 2000) for Biutiful. Else, Colin Firth for The King's Speech or James Franco for 127 Hours. Or, somewhat less likely, Jim Broadbent for Another Year. If NBR voters want to be more than a little “daring” – doing something completely unexpected while picking tried-and-true Hollywood names – then perhaps Michael Douglas for both A Solitary Man and Wall Street: Money Never Sleeps. Annette Bening, who won in 2004 for Being Julia, will likely be the NBR's Best Actress for The Kids Are All Right. Other strong possibilities: Natalie Portman for Black Swan, Nicole Kidman for Rabbit Hole, Helen Mirren for The Tempest, Naomi Watts for Fair Game. Noomi Rapace could win on the strength of three movies: The Girl with the Dragon Tattoo, The Girl Who Played with Fire, and The Girl Who Kicked the Hornet's Nest. And if NBR voters want to be really daring, they may go for Tilda Swinton for I Am Love. Geoffrey Rush or Christian Bale? Best Supporting Actor is a wild guess – wilder than the preceding ones. Our bet would be Geoffrey Rush for The King's Speech, followed by Christian Bale in The Fighter and perhaps Andrew Garfield or Justin Timberlake for The Social Network. Best Supporting Actress is just as hard to predict, especially since there are absolutely no clear favorites at this time. Our bet: Melissa Leo for The Fighter (and perhaps Welcome to the Rileys?). Having said that, Marion Cotillard for Inception, Dale Dickey for Winter's Bone, Helena Bonham Carter for The King's Speech, Amy Adams for The Fighter, Miranda Richardson for Made in Dagenham, to name five, are just as likely. And here's wondering whether Derek Cianfrance's Blue Valentine, which ran into censorship problems, will get the Freedom of Expression Award. Else, that particular award recipient may turn out to be Amir Bar-Lev's documentary about the U.S. military's lies and deception, The Tillman Story. 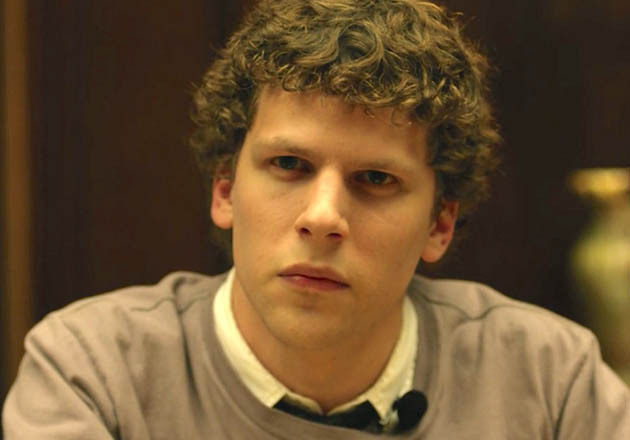 Image of Jesse Eisenberg in National Board of Review Best Film winner The Social Network: Columbia Pictures. 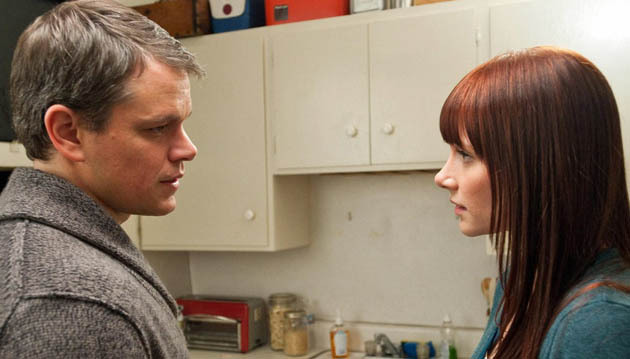 Image of Matt Damon and Bryce Dallas Howard in National Board of Review Top Ten “runner-up” Hereafter: Warner Bros. Image of National Board of Review Best Supporting Actress winner Jacki Weaver in Animal Kingdom: Sony Pictures Classics. Image of National Board of Review Best Actress winner Lesley Manville Another Year: Sony Pictures Classics. “National Board of Review Awards: Clint Eastwood Flop Among Many Surprises” last updated in May 2018.